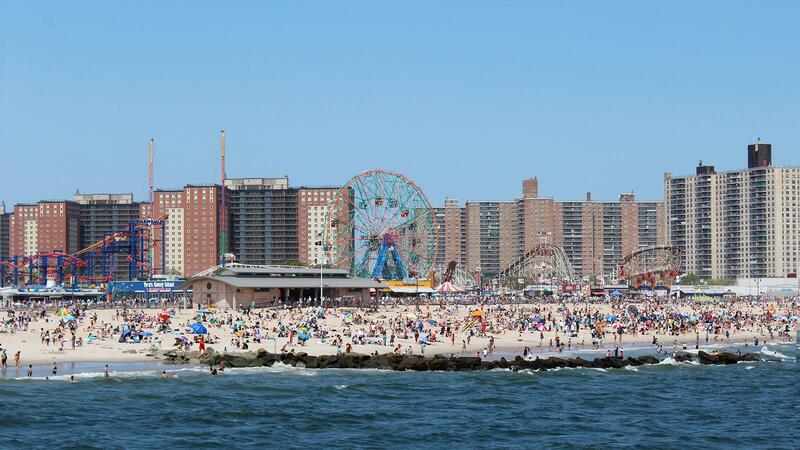 Mixed Case does not condone drinking wine before riding Coney Island's famous Cyclone rollercoaster. Wine tends to fidget when taken out of the house. It gets hot and soupy in the sand. (Remember chemistry class? Ethanol heats up much faster than H20.) It stains the picnic blanket when everyone’s all jostling for the cheese. Despite our best efforts to make it fun and relaxed, wine demands to be housed and squired and served just so. Still, it can be cosseted to taste good on a sunny day. The best bet for wine on your picnic, concert, park-bench people-watching sesh, morning jog, etc. is alternative packaging, and the type that generally best weathers the outdoors is the humble aluminum can. Cans are portable, no-mess, single-serve and quicker to chill than bottles. Aluminum is also one of the most efficient materials to recycle, so you're not doing more damage to the nature that is so graciously hosting you. Francis Ford Coppola’s Sofia Mini blanc de blancs is perhaps the best-known canned wine, and more recent comers include Denver-based Infinite Monkey Theorem and Underwood Pinot Noir, Pinot Gris and rosé from Oregon. All three lines have earned very good scores on our 100-point scale. An alternative alternative package, nicely suited to a lazy river float, is the bag-in-box, removed from box, knotted around the spigot and dangled in the water from your innertube or canoe. It floats! If bottles it must be, a wine tote with an insulated nylon, neoprene or gel-ice-pack interior is generally fine. Double-barrel versions can be had for less than the cost of a $20 bottle of wine, and other types can accommodate up to six bottles. In my experience, these are best in an orderly setting (picnic table), though in terms of temperature control, reds hold up better than crisp whites. Finally, once you’re ready to pour, have a set of “flexible, BPA-free polymer” GoVino glasses. These guys are basically plastic and they drink better than plenty of mid-grade glass stems: The lip is Riedel-thin. They’re shatter-proof, of course, reusable, recyclable and come in stemless wineglass, flute and even decanter form. All the provisions I’ve described here are sand-cheap; after all, you’re not going to need DIY wine service on your megayacht or private terrace. So with summer finally here, it’s time to climb out of the cellar and into the sunlight—you and the wine both. simpler & tastier - get some NZ Sauv blanc with a screwcap & reasonably sized clear plastic cups (or wine glasses) and enjoy. Crisp, clean, refreshing. Best. Beach. Wine. Ever.